Improved blacks, more accurate color, and more granular calibration augment HDR 10+ in its 2018 OLED TVs. Panasonic is releasing new OLED TVs for 2018 that it says feature improved blacks, more accurate color, more granular calibration, as well as support for the new HDR10+ standard developed by the company in conjunction with Samsung and others. HDR10+, the successor to HDR10, adds the dynamic metadata (continuous real-time information about the content) required to adjust a TV on a per-scene, or even per-frame basis. This allows detail and contrast to reach their optimal levels, which in turn creates the high dynamic range effect. There was no mention of support for the competing, royalty required Dolby Vision, which both Panasonic and Samsung have eschewed. Panasonic's press release touts two new OLED panels: the FZ950 and FZ800, which will ship in both 65- and 55-inch flavors. These follow on the existing, well-received 77-inch EZ1000, which has found favor in Hollywood post-production circles as a reference monitor, according to the company. The press release didn't enumerate the differences between the two new models, but we're assuming higher numbers are better. The HCX processor onboard the new OLED TVs is said to be the latest generation, but wasn't specifically called out as new. A new, improved color dynamic lookup table was referenced, however, so it might well be. A color lookup table is used to translate the color specified in the video data, to the closest color available on the TV. It's also used to convert 8-bit color to 10-bit color. Better color mapping equals a better reconciliation between the artist's vision and what you see on screen. Calibration features now conform to the more granular Imaging Science Foundation (ISF) standards, to help fine tune the TVs for the aforementioned post-production needs. Panasonic also says its new TVs deliver 100 percent of the DCI P3 color space, although that's only roughly 80% of the BT.2020 space that's part of the 4K UHD standard. 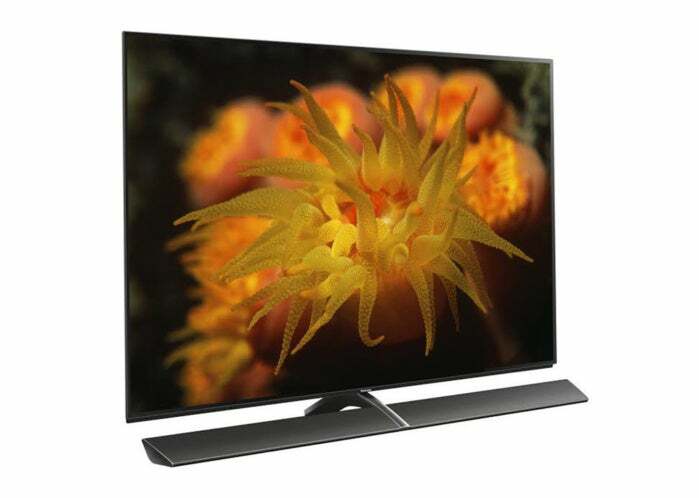 The new Panasonic's OLEDs are 3840 by 2160 (4K UHD) resolution. The other major improvement mentioned is Absolute Black Filter, which is not a rendering technique, but a feature of the panel that absorbs ambient light, rather than reflecting it. In effect, this reduces the glare that interferes with your ability to detect said blacks.